I just wanted to make a quick post to show how great a matching set of dining chairs and counter stools looks. Below is a picture from a custom order that we recently did. Neither style is pictured on our site, but most everything we make can be customized. 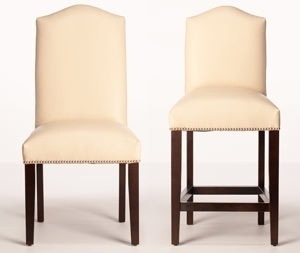 The customer went with counter height stools and dining chairs with tapered legs, both with camel backs and nailhead trim. We were also able to find an off-white leather for her. The finished result looked great and this is a terrific example of what we can do if you just ask. Often we can change a back or leg style at very little or no extra cost. So if you're interested in a tweak to a chair you see on our site, call us or shoot us an email and more than likely we'll be able to fulfill your request.